The growing and preparing of coffee is a longstanding tradition in Ethiopia. Ethiopia is where Coffea arabica, the coffee plant, originates. Although coffee is now grown in various parts of the world; Ethiopia still accounts for around 3% of the global coffee market. Today, I’d like to tell you how I first discovered Ethiopian coffee and how it became my favourite coffee of all. Keep reading until the end of this post where I share a video about the Ethiopian Coffee Ceremony and how coffee is generally drunk in Ethiopia. At university, I would drink coffee all the time. During the day, I’d drink coffee to get me through boring lectures. At night, I’d drink coffee to keep me awake while studying. It was during this time that I developed a taste for the way I drink coffee today: dark, sweet, and preferably with no milk. It’s that particular taste for coffee that led me to what I’d like to tell you about today: Ethiopian coffee. As an (older) adult, I no longer drink coffee as much as I used to. I don’t usually drink coffee in the morning. In fact, I generally try to stay away from coffee because it makes me a little jittery. Nonetheless, after a heavy meal or when I need some pepping up, I often turn back to trusty coffee. In recent years, there’s one coffee that I have come to love above all others. That’s Ethiopian coffee served the traditional way. The first time I drank this kind of coffee was at Habesha Restaurant (in fact, the first time I ever ate at Habesha), when an Ethiopian colleague suggested ordering Ethiopian coffee to wash down the huge wonderful meal we had just had. Ethiopian coffee is served very strong, just the way I like it, and without milk. It is usually accompanied by burning incense which (for me) is half the experience of drinking traditionally brewed Ethiopian coffee. I love the simplicity of Ethiopian coffee, which allows you to truly savor the wonderful flavor of the coffee itself. Until very recently, I had often heard about a famous ceremony surrounding how Ethiopians drink and serve coffee: the Ethiopian Coffee Ceremony. On a recent visit to Addis Ababa, I had the chance to witness this ceremony (or a summarized version of it) in the lobby of the Hilton Addis Ababa Hotel. I saw the process through which everyday Ethiopians take dried Ethiopian coffee beans and turn them into their potent flavorful brew. As if I wasn’t sufficiently enamored with Ethiopian coffee before witnessing this ceremony, the ceremony gave me more background with which to further enjoy the drink. Watch the video below to learn more about how Ethiopian coffee is drunk in Ethiopia. 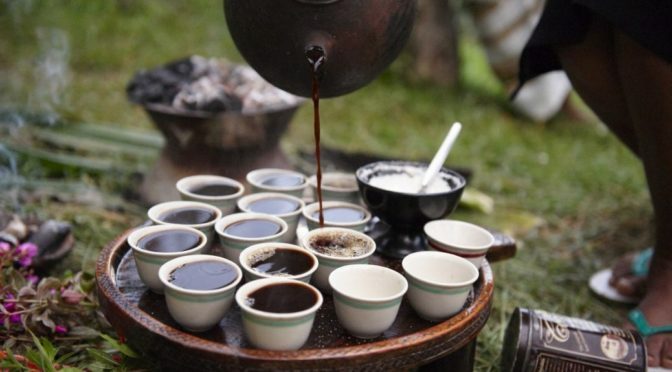 Are you a fan of Ethiopian coffee? Or do you rather prefer the coffee of the coffeehouse culture, complete with complicated Italian-inspired names? If you have never tasted Ethiopian coffee before, I recommend it highly. Simply ask for it at an Ethiopian restaurant near you (FYI, the best Ethiopian coffee I’ve ever had was from Habesha Restaurant in Nairobi so try it there if you are in that city). Hi Biche, I also love Ethiopian coffee. When I was in Ethiopia, it took the ladies more than 2 hours to prepare it (with the green grass and all that), but it was worth the wait. I also like the strong Swahili coffee in Mombasa, and even an Italian espresso. Welcome to ChickAboutTown. Thank you for your feedback. sounds wonderful, but here in this little town of Taos, New Mexico I don’t think thats a possiblity, but I will look for it in the stores. I’ve had to go to one cup a day due to heartburn, but I do enjoy that ONE and it’s fun trying different kinds. We (my honey and I) are currently exploring having traditional Turkisk coffee. we’ll see. Ethiopian coffee really is outstanding! How small a town is Taos? What’s the nearest big city to you? Maybe you might be able to get some authentic Ethiopian coffee there. There are Ethiopian restaurants in many of the bigger cities in the US. Sorry about the heartburn. Out of curiosity, what is Turkisk coffee (or was that just a typo? Did you mean Turkish?)? Tell me more about that kind of coffee! Your response has me smiling, remembering exactly why I love the Internet and blogging so much: I can connect with anyone, anywhere across the world, and learn so much about places I’ve never been to and about lifestyles so different from my own. First and foremost, thanks for sharing. 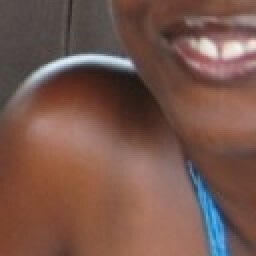 I’ll read your post (thanks for the link) and then inundate you with questions. You live off the grid? That’s cool! More on that after I’ve read your post. Thanks for the heartburn tip. I have never thought of using almonds to cure heartburn and yet I often have almonds on hand at home. Thanks! What can I say? The two best things from Ethiopia are its coffee and women.